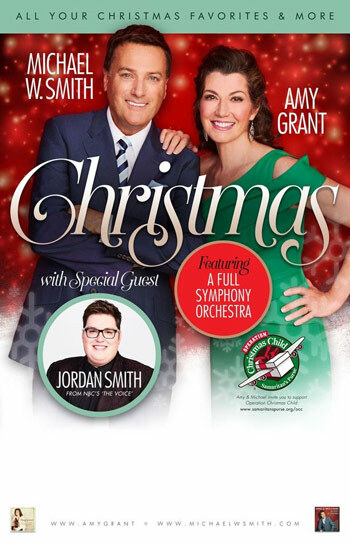 Amidst the highlights of the 23 symphony-infused tour stops, the curated night of holiday music included stylings from Grant’s first all-new Christmas album in nearly 20 years Tennessee Christmas alongside the first holiday album from Jordan Smith, titled ’Tis The Season. While performing songs from his 2014 release, The Spirit of Christmas, Michael W. Smith was surprised on the final night of the tour in Baltimore by Mitch Glazier of the Recording Industry Association of America (RIAA), commemorating his 16 RIAA certified projects. Concertgoers united in supporting kids in need around the globe through Operation Christmas Child, known for distributing over 135 million shoeboxes of Christmas gifts to children in need in 150 countries. To learn more about Operation Christmas Child visit samaritanspurse.org/occ. The Christmas tour was in part made possible by the Israel Ministry of Tourism. For more information, visit Land-of-the-bible.com. Amy Grant's career spans more than 30 years and stretches from her roots in gospel into becoming an iconic pop star, songwriter, television personality and philanthropist. With three multi-platinum albums, six platinum albums and four gold albums, her total career album sales have exceeded 30 million. Grant’s chart success has been consistent throughout her career with six No. 1 hits, 10 Top 40 pop singles, 17 Top 40 Adult Contemporary tracks and multiple Contemporary Christian chart-toppers. In addition to her six GRAMMY® Awards, Grant has earned 26 Dove Awards (including four Artist of the Year Awards) and has been awarded a star on the Hollywood Walk of Fame. Conventional wisdom has it that Grant put Contemporary Christian Music on the map becoming the first Contemporary Christian artist to have a platinum record, the first to hit No. 1 on the Pop charts and the first to perform at the GRAMMY® Awards. With that, her legacy as one of the most influential artists of the past four decades is assured. In April, Grant celebrated the 25th anniversary of her iconic hit “Baby Baby” with a worldwide release of the song featuring pop sensation Tori Kelly. Tennessee Christmas marks Grant’s first all-new holiday album in nearly 20 years. Michael W. Smith is an acclaimed singer, songwriter and musician who has sold more than 15 million albums, achieved 32 No. 1 songs, received 2x RIAA Multi Platinum, 6 Platinum and 16 Gold certified albums, earned three GRAMMY® Awards, one American Music Award and 45 Dove Awards. Amassing an in-depth catalog of achievements, Smith was honored at ASCAP’s 100th Anniversary for his groundbreaking career and significant influence in music. He performed at Former First Lady Barbara Bush’s 90th birthday celebration and also had the privilege to join Former President Clinton, U.S. Secretary of Homeland Security Jeh Johnson and others in remembering victims in the 20th Anniversary of the Oklahoma City attacks. Smith was appointed by the White House as Vice Chair for the President’s Council on service and civic participation and, most recently, was the featured performer at the 2015 USO Gala and recognized as a USO veteran. In addition to the international impact he has had through multiple global tours, he has written and composed various scored film projects, has authored 12 books, has acted in assorted motion pictures and has been featured by numerous national media outlets. He founded, and actively supports, the teen club Rocketown – a nonprofit outreach for teens, providing opportunities in arts, music, sports and mentoring programs. This year also marks the 25th anniversary in partnership with Compassion International, seeing more than seventy thousand families’ and children’s lives changed, around the world. Jordan Smith’s much anticipated debut album, Something Beautiful [LightWorkers Media/Republic Records], is available now everywhere. Throughout the album, his undeniable delivery and instantly recognizable range drives both original songs and cover tracks produced by legends such as GRAMMY® Award winning producer David Foster [Céline Dion, Michael Bublé, Josh Groban] and modern hit maker Stephan Moccio [The Weeknd, Ellie Goulding, Miley Cyrus]. The 22-year-old from Harlan, Ky., Jordan Smith stands out as the highest-selling artist to ever emerge from NBC’s EMMY AWARD®-winning “The Voice.” In less than six months, he sold over 1 million singles and made Voice history by landing eight songs in the iTunes Top 10—the first artist from any season to hit the iTunes Top 10 every single week of the Live Rounds. Of the eight songs that went Top 10 on iTunes, six hit Top 3, and three captured #1 on iTunes, all of which knocked Adele off the top spot! His first holiday album, 'Tis The Season, is available now. Since 1993, Operation Christmas Child has collected more than 135 million gift-filled shoeboxes for children in more than 150 countries and territories. In 2016, Operation Christmas Child hopes to reach another 12 million children. To learn about year-round volunteer opportunities or to serve with Operation Christmas Child, visit samaritanspurse.org/occ.